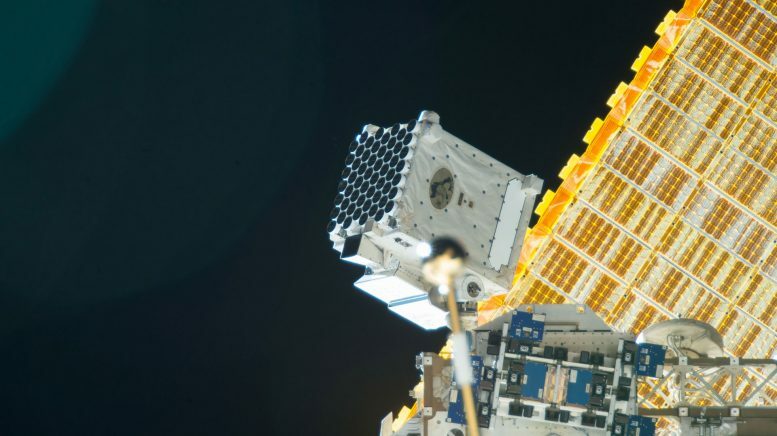 Scientists have charted the environment surrounding a stellar-mass black hole that is 10 times the mass of the Sun using NASA’s Neutron star Interior Composition Explorer (NICER) payload aboard the International Space Station. NICER detected X-ray light from the recently discovered black hole, called MAXI J1820+070 (J1820 for short), as it consumed material from a companion star. Waves of X-rays formed “light echoes” that reflected off the swirling gas near the black hole and revealed changes in the environment’s size and shape. A paper describing the findings, led by Kara, appeared in the Jan. 10 issue of Nature. J1820 is located about 10,000 light-years away toward the constellation Leo. The companion star in the system was identified in a survey by ESA’s (European Space Agency) Gaia mission, which allowed researchers to estimate its distance. Astronomers were unaware of the black hole’s presence until March 11, 2018, when an outburst was spotted by the Japan Aerospace Exploration Agency’s Monitor of All-sky X-ray Image (MAXI), also aboard the space station. J1820 went from a totally unknown black hole to one of the brightest sources in the X-ray sky over a few days. NICER moved quickly to capture this dramatic transition and continues to follow the fading tail of the eruption. A black hole can siphon gas from a nearby companion star into a ring of material called an accretion disk. Gravitational and magnetic forces heat the disk to millions of degrees, making it hot enough to produce X-rays at the inner parts of the disk, near the black hole. Outbursts occur when an instability in the disk causes a flood of gas to move inward, toward the black hole, like an avalanche. The causes of disk instabilities are poorly understood. Above the disk is the corona, a region of subatomic particles around 1 billion degrees Celsius (1.8 billion degrees Fahrenheit) that glows in higher-energy X-rays. Many mysteries remain about the origin and evolution of the corona. Some theories suggest the structure could represent an early form of the high-speed particle jets these types of systems often emit. 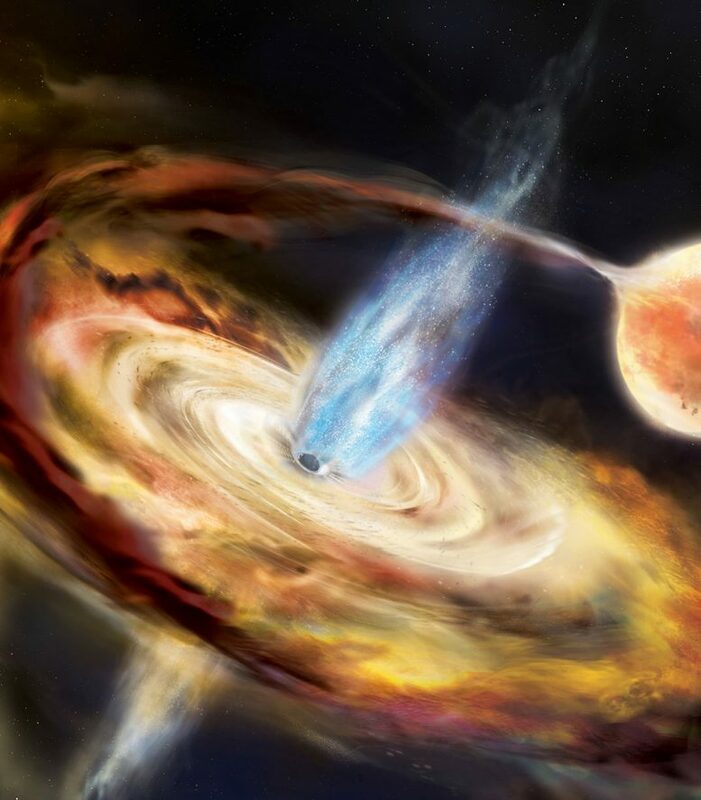 Astrophysicists want to better understand how the inner edge of the accretion disk and the corona above it change in size and shape as a black hole accretes material from its companion star. If they can understand how and why these changes occur in stellar-mass black holes over a period of weeks, scientists could shed light on how supermassive black holes evolve over millions of years and how they affect the galaxies in which they reside. One method used to chart those changes is called X-ray reverberation mapping, which uses X-ray reflections in much the same way sonar uses sound waves to map undersea terrain. Some X-rays from the corona travel straight toward us, while others light up the disk and reflect back at different energies and angles. X-ray reverberation mapping of supermassive black holes has shown that the inner edge of the accretion disk is very close to the event horizon, the point of no return. The corona is also compact, lying closer to the black hole rather than over much of the accretion disk. Previous observations of X-ray echoes from stellar black holes, however, suggested the inner edge of the accretion disk could be quite distant, up to hundreds of times the size of the event horizon. The stellar-mass J1820, however, behaved more like its supermassive cousins. As they examined NICER’s observations of J1820, Kara’s team saw a decrease in the delay, or lag time, between the initial flare of X-rays coming directly from the corona and the flare’s echo off the disk, indicating that the X-rays traveled shorter and shorter distances before they were reflected. From 10,000 light-years away, they estimated that the corona contracted vertically from roughly 100 to 10 miles — that’s like seeing something the size of a blueberry shrink to something the size of a poppy seed at the distance of Pluto. To confirm the decreased lag time was due to a change in the corona and not the disk, the researchers used a signal called the iron K line created when X-rays from the corona collide with iron atoms in the disk, causing them to fluoresce. Time runs slower in stronger gravitational fields and at higher velocities, as stated in Einstein’s theory of relativity. When the iron atoms closest to the black hole are bombarded by light from the core of the corona, the X-ray wavelengths they emit get stretched because time is moving slower for them than for the observer (in this case, NICER). Kara’s team discovered that J1820’s stretched iron K line remained constant, which means the inner edge of the disk remained close to the black hole — similar to a supermassive black hole. If the decreased lag time was caused by the inner edge of the disk moving even further inward, then the iron K line would have stretched even more. NICER is an Astrophysics Mission of Opportunity within NASA’s Explorer program, which provides frequent flight opportunities for world-class scientific investigations from space utilizing innovative, streamlined and efficient management approaches within the heliophysics and astrophysics science areas. NASA’s Space Technology Mission Directorate supports the SEXTANT component of the mission, demonstrating pulsar-based spacecraft navigation. 1 Comment on "Scientists Chart Environment Surrounding a Stellar-Mass Black Hole"
I only have one. Black Holes siphon materials because of the absence of Matter. I’d love to explain it. But it would be dismissed due to the ignorance of those who believe that they are correct.